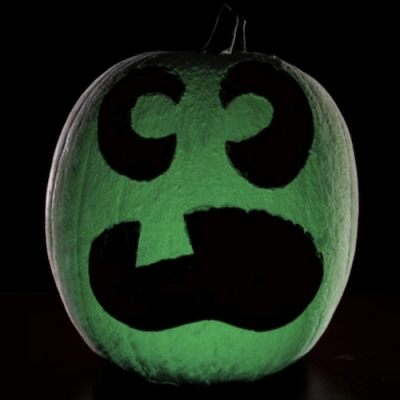 I’m not a huge fan of carving jack-o-lanterns…the pulp burns my skin, it makes a sticky mess all over and my kids lose interest and ask me to carve their design almost immediately after starting. Despite despising pumpkin carving, every Halloween I see amazing designs and decide I’ll try it again. My girls also always find the perfect pumpkin at a Pumpkin Patch or grocery store and we drag it home in hopes of creating pumpkin envy in the neighborhood. This year, it’s going to be different. We are skipping the carving, the mess, the burning and the frustration and decorating the outside of the pumpkin instead. Pinterest is full of all kinds of pumpkin painting and decorating. Some are incredibly elaborate and works of art. The one thing that is missing from most is their ability to glow in the dark on Halloween night. That’s my favorite part of jack-o-lanterns…watching them glow on the crisp fall evening. 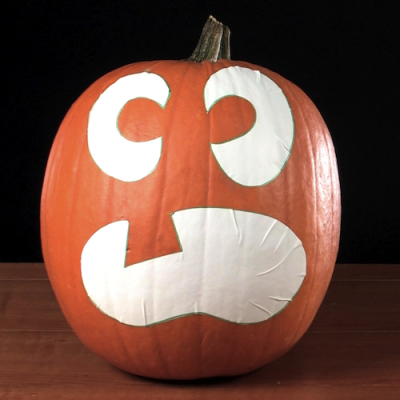 Here’s an easy and kid-friendly way to decorate your Halloween pumpkins without knives or seeds or pulp. Once your jack-o-lantern face is complete, take your pumpkin outside and place it on the drop cloth. 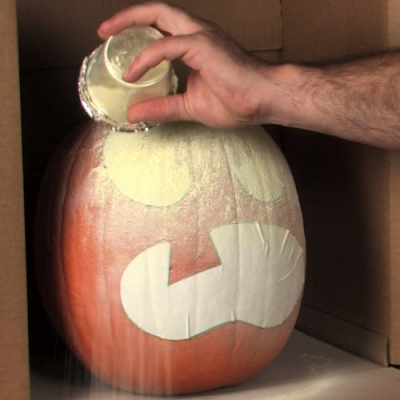 If you need to do the experiment indoors, make sure that you are in a well-ventilated area and place the pumpkin in the cardboard box. After the pumpkin is dry, your spooky Halloween decoration is ready! 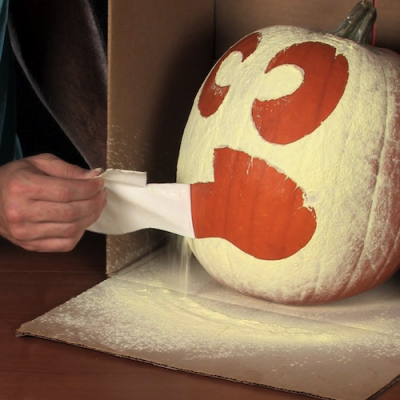 Carefully pull the contact paper off of the pumpkin. 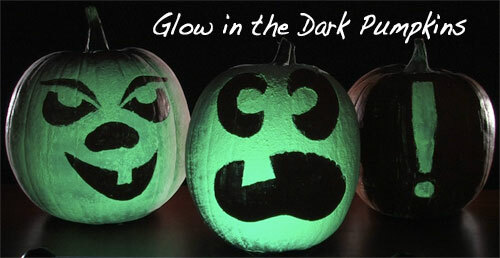 Place the pumpkins next to a black light for an extra bright glow on Halloween. 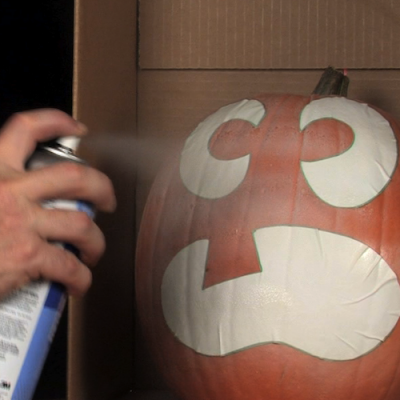 For more on the science behind this experiment, visit the Glowing Pumpkins Experiment page on SteveSpanglerScience.com. Ohh that’s so cute..I think it’s a lovely post and a unique idea of using pumpkin in halloween party. Which spray adhesive and sealant did you use (vendor and product name)? Zinc sulfide isn’t cheap, so I want to make sure this works the first time. We used 3M General Purpose adhesive spray. It doesn’t have to be 3M but that is the kind we have found works well. Good luck with creating your pumpkin! Where did you find the Glow Powder? I have the 3M adhesive spray, but don’t know what sealant to use. Any suggestions? We didn’t actually use sealant on our pumpkins. If you don’t move them around or touch them a lot, you won’t need to seal it up. You could maybe try clear paint or Modge Podge to seal it if you need something to protect the powder. What a lovely idea! How long does the glowing last in dark space? Rustoleum makes a glow in the dark spray paint. Maybe that would work instead of adhesive and powder?